I recently wrote Melissa and Doug (an amazing high quality brand that is in like every store you will ever walk into, except well, gas stations or something), and let them know I love their products but that they are missing a few pieces. For example, they often have great “extension activities” written on the back of their products that are developmentally awesome and clearly written by someone very skilled. Yet the average person won’t understand WHY these extension activities are helpful/useful, especially in regards to its applications to daily life skills. Many people think play is a waste of time and children are better off spending their time learning their academic skills. These people need education, because play is the number one way that children learn about their environment, and they need really strong foundational skills in their awareness of their own body and brain’s capabilities before they can truly apply it most successfully to the academic environment. All play toys can be used to work on academic skills and/or skills applicable to daily life interactions, with just some creative tweaking. For example, I took this toy off their site at random and instantly spouted off the following ideas. 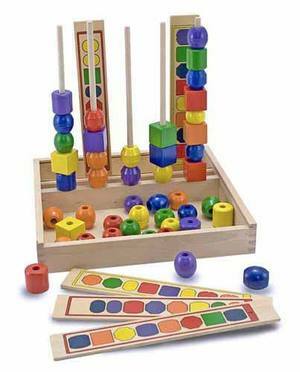 Their website talks about how it works on matching, sequencing, and fine motor skills. Great, and I realize they don’t want to write a sixty page essay on its other uses. But I can. AHAHAHAAHAHA. It can be slightly modified – easily and without set-up – to work on many other types of skills. Gross motor, fine motor, sensory motor, ocular motor, visual motor…executive functioning skills, speech skills, general cognition, etc etc. 2. Social Skills: “My turn, your turn”, used for turn-taking in board games, Lego building, etc. Interacting appropriately with peers in a non-competitive setting. 5. Visual Motor and Ocular Motor Skills: Teasingly maneuver the beads in slow movements and overhead or in other planes, requiring the child to instinctively reach for the bead while tracking with their eyes and projecting where the piece is likely moving. If the pieces are put overhead, the child has to extend their arm, helping put the fingers in a more precise position, strengthening, changing focus, etc. 6. Creativity/Flexibility/Imagination: Take the beads and use them on dull bamboo skewers and toothpicks and similar tools, placed into leftover electronic styrofoam (done by child themselves if nothing sharp). and allow the child to decorate with the beads, making their own little palaces. Abstract ways to use concrete items. 7. Fine Motor: Hold the bead out to the child, grasping it carefully so only a tiny bit of it shows, and then have the child reach for it (when done in a silly or careless manner, the child won’t even realize it’s on purpose), because only a small bit of it is exposed and it will require a precise grasp for the child to access it. 8. Stereognosis/tactile discrimination: Place the beads into a pillowcase or box. With eyes closed or obscured, have the child feel the beads and figure out the shapes. There are many ways to make this task easier or harder, but it’s an important skill, used for getting our phones out of our purses, our pencils out of our desks or backpacks without looking, etc. Any OT worth their salt (salts not worth that much these days though, so maybe worth their titanium), would be able to easily rattle off another six thousand trillion jillion zakillion more ideas within seconds. And I never exaggerate. Okay, one time I did. Like sixty years ago. 1. Take dinosaur post-it or other random animal paper. Child cuts across animal. 2. Child is veterinarian and fixes animal. (Skim over the fact we were directly responsible for its hurt, cough). 3. Give child a band-aid. 4. Child puts animal pieces together in right orientation, secures band-aid. Harder: Multiple lines, thinner lines, curvy or wiggled lines, lower contrast lines, more directions, having child make own lines first and cut out own. Easier: Open the band-aid or help the process (start it until manageable by child, such as peeling the bandaid pieces a tiny bit apart and child takes over). Help hold the papers down so child can apply bandaid. 2. KIDS LOVE BANDAIDS. I didn’t have any cool ones, but that would help even more. If you have more than one type, let them choose. 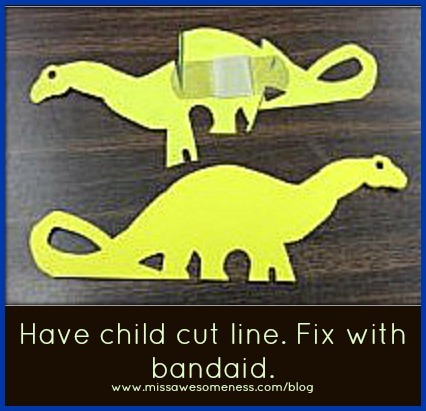 Even children resistant to cutting/directions may complete this task if they see a band-aid is involved!